Educators from The College Preparatory School in Oakland, California, have provided these resources and tools for collaborative learning. 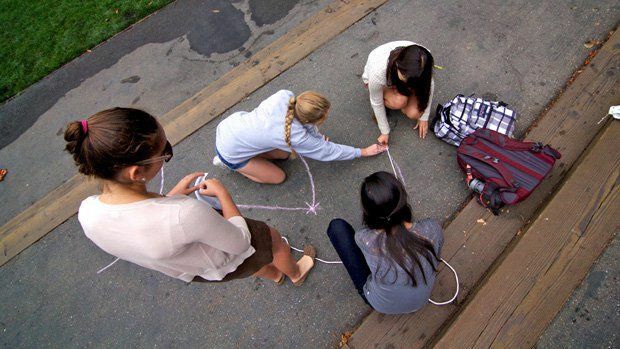 Students work collaboratively in many ways to reinforce learning at The College Preparatory School, such as working together outside on geometry concepts they learned the previous day in the classroom. At The College Preparatory School (College Prep) in Oakland, California, student collaboration happens on a daily basis, from group-centered math assignments, to student-led discussions in English. Below are documents provided by College Prep English teacher Julie Anderson and Math teacher Betsy Thomas. English classes at College Prep are conducted around a large, oval table called a Harkness Table. Anderson's students often have online discussions prior to in-class discussions. Student Responses (example 1) - Sample of online student responses. The assignment for this online discussion was to come up with three questions, one based on the text, one on a discussion question, and one on a personal question. The discussion was about Plato's Allegory of the Cave. Student Responses (example 2) - Another example of online student responses. The assignment for this online discussion was to answer one or more of the questions posed by students in the online discussion from the night before. The discussion was about Plato's Allegory of the Cave.